It's been revealed that Kyary Pamyu Pamyu will be releasing her Nippon Budokan concert on DVD and Blu-ray on February 13th. 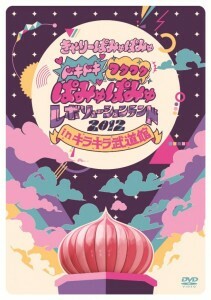 Kyary's first live DVD and Blu-ray will be titled 'Doki Doki Waku Waku Pamyu Pamyu Revolution Land 2012 in Kira Kira Budokan'. It will feature 20 songs she performed during her concert at Nippon Budokan on November 6th. The limited edition DVD will come with a photo book as well as a special DVD including documentary, past live footage, and choreography videos for "Fashion Monster" and "Tsukema Tsukeru". The jacket cover and track list can be seen below. SKE48 releases jacket covers + track list for "Choco no Dorei"